Achilles Tendonitis cured with the infrared sauna. Achilles Tendonitis : Victor from the US sent us his story. My achilles tendonitis story : I purchased an infrared sauna last summer around September. I had just gone through 3 weeks of therapy for Achilles Tendonitis (AT). AT is very uncomfortable for people of all ages. I was 29 at the time and my Achilles on both feet had been bothering me for over a year. This was a flare-up of AT that I had on just one foot 2 years previous. I'll give a brief history of myself. I was 27 and fairly active in sports. When I had the first flare up I was in a softball league that had 4 games a week. I was in a basketball league that had one game a week. I was also a letter carrier for the USPS. As you can see, I was very active! That soon ended when I could barely walk out of bed in the mornings. The same problems I had in the mornings were then happening throughout the day. I couldn't sit for long periods of time or else my achilles would tighten up. Soon I went to the doctor and was quickly placed in a boot for 8 weeks. After some therapy to strengthen the achilles in both feet, I was new again! Fast forward to me at the age of 29 and now I had Achilles Tendonitis on BOTH achilles. For almost a year I was inactive. I was now approaching the young age of 30....with an additional 25 lbs! I was now at 225 lbs. Most of my twenty's I was around 195-200lbs. It was the first time I could remember NOT being active. I got tired of "waiting" it out as the doctors recommended! I went to therapy for 3 and a half weeks and my legs got much stronger, but I still wasn't the same. I still had flare-ups. During the time I was in therapy I had been doing extensive research on saunas. 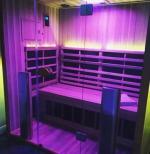 I decided to purchase an infrared sauna from Sauna-Pro mainly because of the cost. Price was reasonable...in my range. It arrived a couple weeks AFTER I had finished my therapy. Within 2 or 3 weeks, I noticed a major difference in both my achilles. I would stretch while in the sauna every time. It became a habit and I began stretching more and more inside and outside the sauna. The direct heat gave such a soothing feeling on the achilles area, not to mention any other sore muscles that I had. We are now in February and I am playing basketball FULL SPEED twice a week with NO problems. I wake up in the morning and feel great. I still stretch every day and that obviously had a great impact on my improvement. But I know the infra red therapy has had as much an impact. Being that I have gone through Achilles Tendonitis TWICE, I can compare both times. The only difference this time is that I had the problem on BOTH feet and I also added the sauna therapy. Speaking of saunas..mine's heating up right now so I will end this posting. By the way, it only takes 10-15 minutes to heat up. If anyone has any questions about them, I can answer any questions. I can only tell about the infrared sauna I have. Haven't tried dry or wet saunas. I hope this can help someone out there!! Take care and God bless. Share your own experience like this Achilles Tendonitis story with others.